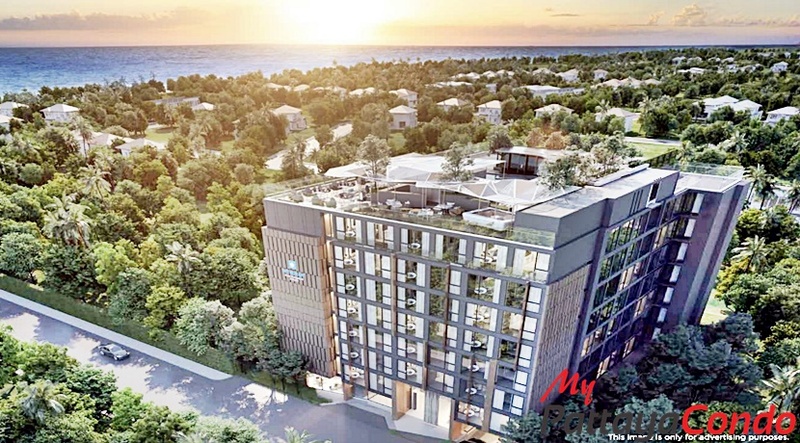 Wyndham Atlas WongAmat Pattaya is situated on a prime 1 Rai 53 Square Wah plot of land alongside Naklua Soi 22 and is literally only 200 meters from WongAmat Beach and 300 meters away from the new “Terminal 21 Shopping Mall”. The project is comprised of 192 deluxe rooms, junior and 1 bedroom suites spread across a low-rise, 8 story building with a central atrium as it’s main show piece. Additional amenities include a double height lobby entrance and reception area, several onsite restaurants such as an all day restaurant serving Thai & Western cuisine, a club executive lounge (available for clubroom and suite guests only) serving complimentary snacks and cocktails and a rooftop eatery and pool bar serving mediterranean food. The projects modern architectural design and locally sourced building materials to create a seamless transition between both the interior and exterior of the building. Perhaps the most surprising element of this project is almost certainly the stunning rooftop swimming pool with it’s partial glass overhang and punctured glass openings, which not only allows the natural sunlight to shine through but also gives swimmers a birds eye view of the world below. The Developer is the “Habitat Group” which was first incorporated back in 2012 and since then has become one of Thailands leading property developers in the luxury residential market with more than 12 property and design awards to it’s name and future plans to launch an initial public offering (IPO) on the Stock Exchange of Thailand in the coming years. To date the developer has primarily invested in condominiums and townhouses in the Bangkok central business district (CBD), and more recently is branching out to other areas such as Pattaya. Working in close collaboration with ECG Research, the property is to be managed by the “Wyndham Hotel Group”, who are major players on the international hospitality scene with over 18 globally recognized brands to their name, and more than 8,000 hotels and a total of 697,600 rooms in over 77 countries worldwide under management. Other projects under the “Habitat Group” umbrella include the “Walden Asoke”, “Leroy Ruamrudee”, “BluPhere Pattaya”, “BW Premier Collection”, “Premier Best Western Bayphere Pattaya”, “X2 Cross Pattaya Oceanphere”, “X2 Pattaya Seaphere” and “The Ville Jomtien” to name but a few. So how does this investment scheme work? In essence one is simply buying a condo with a freehold title much like any other condo. If you’re looking to purchase a condo for personal use, then this investment is not for you. However if you’re looking to buy an income generating rental investment property, then this may prove to be an ideal solution for you minus the property management headaches. This is a totally hands free, hassle free investment which will generate you a 6% guaranteed return on your investment over the first 5 Years, followed by a passive income 60/40 profit sharing scheme after 5 Years and up to 14 Days of free stay within the project per Year subject to you signing a mandatory 30 Year lease agreement with the Developer and hotel chain operator. To avoid any confusion about the 30 Year lease, please remember that you always hold the freehold title and the condo will be handed back to you to do with as you please once the 30 Year lease has expired. a)Free stay 14 Days (no breakfast) per Year. 10 Days Monday-Thursday & 4 Days Friday-Sunday. b) Freehold title with a 30 Years signed lease agreement and 6% guaranteed rental returns over 5 Years. c) Opportunity to earn long term passive income from 60% profit sharing scheme after the 5th Year. Infinity edged rooftop swimming pool with a jacuzzi zone and partial glass bottom that protrudes over the edge of the building so that swimmers can see the world below. Rooftop sundeck with sunken pool side furniture surrounded by lush tropical landscaped gardens and outdoor terraces. Rooftop 40 Degree North eatery and bar serving mediterranean cuisine. On-site ground floor all day restaurant serving Thai and Western cuisine. On-site private executive lounge serving snacks and complimentary cocktails throughout the day for guests staying in the clubrooms and suites. Fully-equipped fitness zone with the latest cardio-vascular equipment and floor to ceiling windows with breathtaking views over looking the sea and city. On-site room service and house-keeping services at commercial rates. Stunning show piece central atrium with natural light shining through the punctured glass openings of the overhead rooftop swimming pool. Ground floor double height hotel lobby and entrance area. Panoramic floor to ceiling windows with spectacular sea and/or city views. Ultra luxurious bathroom(s) with solid surface sink counter-top(s), modern white porcelain sink(s) and toilet(s) together with rain shower(s) and tempered glass shower enclosures. Fully-furnished luxury furniture package with high quality soft furnishing(s) and electrical appliance(s). 6% Rental guarantee per annum for 5 Years. Long term passive income profit sharing investment scheme after 5 Years. Professional on-site property management by the internationally branded “Wyndham Hotels & Resort Group”. Complimentary free stay for 14 Days per Year within the “Wyndham Atlas WongAmat Pattaya”. Pattaya Beach & Naklua Road Baht Bus Routes: 3-Minutes (Walking). Terminal 21 Shopping Mall: 3-Minutes (Walking). Dusit Thani Hotel: 3-Minutes (Walking). Woodland Resort & Hotel and La Baguette Bakery: 3-Minutes (Walking). Central Marina Shopping Mall: 6-Minutes (Walking). Amari Hotel & Mantra Restaurant: 6-Minutes (Walking). Holiday Inn Hotel & Pattaya Beach: 7: Minutes (Walking). Royal Garden Shopping Center: 7-Minutes (Car). Pattaya Floating Market: 18-Minutes (Car). Phoenix Country & Golf Club: 28-Minutes (Car). Silver Lake Vineyard, Golden Buddha Mountain & Ramayana Water Park: 28-Minutes (Car). Wyndham Atlas Wong Amat Pattaya is scheduled to be completed in 2020. No. of Units: 192 Units. Project Land Size: 1.13 Rai/1,812 Square Meters. Transfer Taxes: 2% Transfer Fee Paid by Buyer. Stamp Duty, Special Business & With-holding Taxes Paid by Seller.